About four-in-five of the nation’s estimated 11.1 million unauthorized immigrants are of Hispanic origin (Passel and Cohn, 2010). A new national survey by the Pew Hispanic Center, a project of the Pew Research Center, finds that Latinos are divided over what to do with these immigrants. A small majority (53%) says they should pay a fine but not be deported. A small minority (13%) says they should be deported, and a larger minority (28%) says they should not be punished. 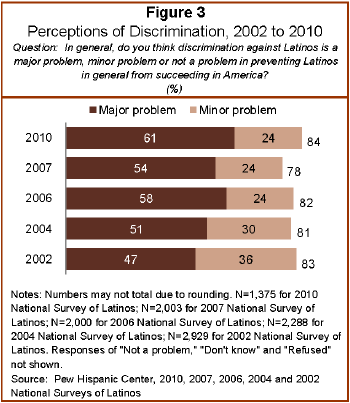 Today, more than six-in-ten (61%) Latinos say that discrimination against Hispanics is a “major problem,” up from 54% who said that in 2007. Asked to state the most important factor leading to discrimination, a plurality of 36% now cites immigration status, up from a minority of 23% who said the same in 2007. Back then, a plurality of respondents—46%—identified language skills as the biggest cause of discrimination against Hispanics (Pew Hispanic Center, 2007). In the new survey, Latinos are also split over whether immigrant and native-born Latinos are working together to achieve common political goals. About half (45%) say they are, and half (46%) say they are not. Both the native born (who comprise 47% of the adult Latino population) and the foreign born (who comprise 53%) are roughly equally divided on their perceptions of political solidarity. The native born and foreign born have different views on many topics explored in the survey. For example, seven-in-ten (70%) foreign-born Latinos say discrimination against Hispanics is a major problem preventing Latinos from succeeding in America. Less than half (49%) of the native born agree. And when it comes to their views of immigrants, fewer than seven-in-ten native-born Hispanics say immigrants strengthen the country, while 85% of immigrant Hispanics say the same. At 47 million strong, Latinos are the nation’s largest minority group, comprising nearly 15% of the total U.S. population. Some 38% of all Latinos are immigrants, and an estimated 19% are unauthorized immigrants. The findings are from a new national survey of 1,375 Latino adults conducted by landline and cellular telephone, in English and Spanish, from August 17 through September 19, 2010. The margin of error is plus or minus 3.3 percentage points for the full sample and larger for subgroups. For details on the survey methodology, see Appendix A. While the survey finds differences among Latinos on several questions related to illegal immigration, it also finds many points of broad agreement—especially when it comes to enforcement policies and proposals. For example, fully 86% of Latinos support providing a path to citizenship for illegal immigrants if they pass background checks, pay a fine and have jobs, a level of support far greater than among the general public (68%) (Pew Research Center for the People & the Press, 2010a). Among Latinos, about eight-in-ten (82%) of the native born and nine-in-ten (90%) of the foreign born say they support providing a path to citizenship for illegal immigrants. On birthright citizenship, nearly eight-in-ten (78%) Latinos say the Constitution should be left as is, compared with 56% of the general public who say the same. And when it comes to who should enforce the nation’s immigration laws, more than three-quarters (77%) Latinos say it should be the exclusive responsibility of federal authorities, while just 15% say the local police should play a more active role. On both questions, the native born and the foreign born hold similar views. Finally, the vast majority of Latinos—79%—disapprove of the first-of-its-kind Arizona law enacted this year that gives police broad powers to check the immigration status of people they stop for other reasons whom they suspect may be in this country illegally.2 By contrast, the general population approves of the measure by a ratio of two-to-one (Pew Research Center for the People & the Press, 2010a). Despite Latinos’ rising concerns about suffering from a backlash triggered by illegal immigration, the new survey finds no increase over past years in the share of Latinos who report that they or someone they know have been targets of discrimination or have been stopped by the authorities and asked about their immigration status. About a third of all Hispanics (34%) say they, a member of their family or a close friend have experienced discrimination in the past five years because of their race or ethnic group. The figure is largely unchanged from 2009, when it stood at 32% (Pew Hispanic Center, 2009). And just 5% say they have been stopped by the police or other authorities and asked about their immigration status, down from 9% who said the same in 2008 (Lopez and Minushkin, 2008). 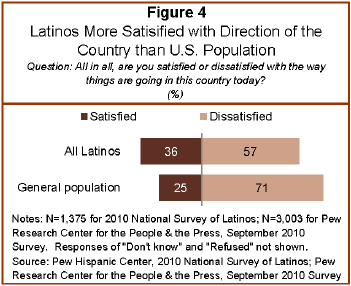 Moreover, more than a third of all Hispanics (36%) say they are satisfied with the current overall direction of the country, up from 25% who said the same in 2008 (Lopez and Minushkin, 2008). On this question, Hispanics are more upbeat than all Americans. Only about a quarter (25%) of the general public said in late summer they were satisfied with the way things in the country were going (Pew Research Center for the People & the Press, 2010b). When it comes to their own lives, Latinos are generally upbeat. Nearly seven-in-ten rate the quality of their lives as either “excellent” (24%) or “good” (45%), virtually unchanged from three years ago (Pew Hispanic Center, 2007). 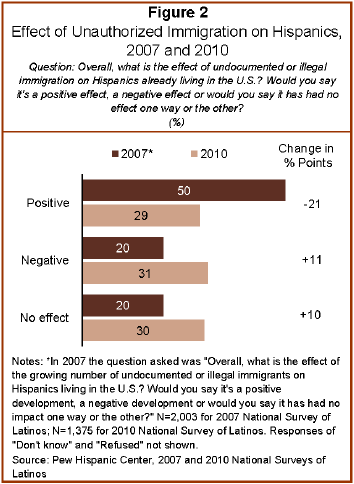 Hispanics are more positive than all Americans about the impact of immigrants on the nation. Nearly eight-in-ten Hispanics (78%) say immigrants to the U.S. strengthen the country, while 13% believe these new arrivals are a burden. In contrast, all Americans are split—44% say immigrants are a strength, and 42% say they are a burden. Half (49%) of all Hispanics say that Americans are less accepting of immigrants now than they were five years ago. One-in-five (20%) believe Americans are more accepting, and 28% say they see no change. More than eight-in-ten (81%) Latinos say opportunity is better in the U.S. than in their home countries or the countries of their ancestors. This share is down from 92% in 1999 (Washington Post/Kaiser Family Foundation/Harvard University, 1999). Three-in-ten (30%) Latinos say that one of the reasons unauthorized immigrants come to the U.S. is to have a child here; 64% say this is not the case. Half (52%) of Latinos say they worry “a lot” or “some” that they, a family member or a close friend could be deported. Foreign-born Hispanics are more than twice as likely as native-born Hispanics to say they worry that they or someone they know could be deported—68% versus 32%. One-third (32%) of Latinos say they know someone who has been deported or detained by the federal government in the past 12 months. Some 45% of foreign-born Latinos who are not U.S. citizens or legal residents say they know someone who has been detained or deported by the federal government in the past 12 months. Fewer than three-in-ten (28%) of native-born Latinos say the same. Fully 78% of Latinos say they support in-state tuition rates for unauthorized immigrant students who graduate from a high school in their state and have been accepted into a public college or university. Nearly three-in-four (73%) Latinos say they disapprove of workplace raids, unchanged from 2007 and 2008. More than six-in-ten (61%) Hispanics say they disapprove of building more fences on the nation’s borders. Latinos are split on whether the number of border patrol agents should be increased—48% say they approve of this idea, while 46% say they disapprove. A majority (58%) of Hispanics say they approve of a proposal that would require all U.S. residents to carry a national identity card. The issue of immigration is not a top issue for all Hispanics. On a list of seven issues, it ranks fourth, behind education, jobs and health care. More than six-in-ten (62%) Latinos say they have talked with a family member, friend or co-worker about the immigration policy debate in the past year. Half (51%) of Latinos say they have more confidence in the Democratic Party’s agenda on immigration than in the Republican Party’s agenda, while 19% say they have more confidence in the Republican agenda on immigration. One-in-seven (15%) Hispanics say that in the past year they have participated in a protest or demonstration in support of immigration rights, down from 24% who said the same in 2006. The 2010 National Survey of Latinos (NSL) focuses on the views and opinions of Latinos about immigrants, illegal immigration and immigration policy. The survey was conducted from August 17 through September 19, 2010, among a randomly selected, nationally representative sample of 1,375 Latino adults, 542 of whom are native born and 833 of whom are foreign born. The survey was conducted in both English and Spanish on cellular as well as landline telephones. For more details, see Appendix A. Language dominance is a composite measure based on self-described assessments of speaking and reading abilities. “Spanish-dominant” persons are more proficient in Spanish than in English, i.e., they speak and read Spanish “very well” or “pretty well” but rate their ability to speak and read English lower. “Bilingual” refers to persons who are proficient in both English and Spanish. “English-dominant” persons are more proficient in English than in Spanish.